The top Democrat in the US Congress ordered a safety review for a Muslim lawmaker and her family Sunday after accusing President Donald Trump of putting her in danger by tweeting a video of her spliced with footage of the 9/11 attacks. "Following the president's tweet, I spoke with the sergeant-at-arms to ensure that Capitol Police are conducting a security assessment to safeguard Congresswoman Omar, her family and her staff," she said. "The president's words weigh a ton, and his hateful and inflammatory rhetoric creates real danger. President Trump must take down his disrespectful and dangerous video." Trump's spokeswoman Sarah Sanders, meanwhile, defended the president Sunday against accusations that he was inciting violence toward Omar. Omar has been at the center of an escalating row after a clip emerged of her characterizing the deadliest attack on US soil as "some people did something." On Friday, Trump tweeted a video that juxtaposed the snippet -- which Omar's fellow Democrats say was taken out of context -- with images of the hijacked planes used in the attacks crashing into the World Trade Center's twin towers that once dominated New York's skyline. Menacing music accompanies Omar's words. The clip, which had been viewed more than 9.4 million times as of Sunday afternoon, ends with the words: "SEPTEMBER 11 2001 WE REMEMBER." Omar said in a statement posted on Twitter Sunday that many of the increased threats she had received were "directly referencing or replying to the President's video." "Violent crimes and other acts of hate by right-wing extremists and white nationalists are on the rise in this country and around the world," she said. "We can no longer ignore that they are being encouraged by the occupant of the highest office in the land." "We are all Americans. This is endangering lives. It has to stop." Prominent Democrats including Beto O'Rourke, Kamala Harris and Omar's fellow first-time Congresswoman Alexandria Ocasio-Cortez were quick to rush to Omar's defense, accusing the president and other Republicans of deliberately de-contextualizing her remarks and endangering her life. Sanders, however, defended Trump, telling ABC television's "This Week" that "the president is wishing no ill will and certainly not violence towards anyone." But, she added: "It's absolutely abhorrent the comments she continues to make and has made and (Democrats) look the other way. "I find her comments to be absolutely disgraceful and unbefitting of a member of Congress and I think that it's a good thing that the president is calling her out for those comments, and the big question is why aren't Democrats doing it as well." "CAIR was founded after 9/11," she added, "because they recognized that some people did something and that all of us were starting to lose access to our civil liberties." The speech did not initially receive significant attention until the snippet in question was highlighted weeks later by controversial Australian personality Mohammad Tawhidi who refers to himself as the "Imam of Peace." 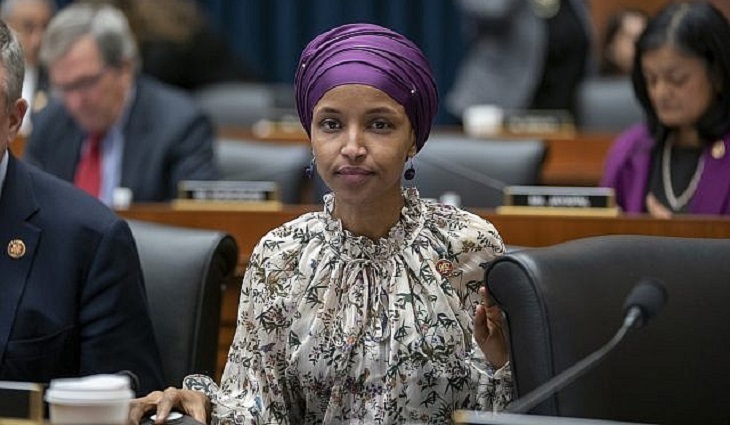 Omar mounted a trenchant fightback, tweeting Saturday: "No one person -- no matter how corrupt, inept, or vicious -- can threaten my unwavering love for America.